With homify 360°, we make it our mission to bring you daily discoveries of architectural wonders worldwide, whether modern, rustic, industrial, contemporary or otherwise. Today’s dose of creative construction comes to us from Balham in south London. Architectural agency Etc Urban was given an existing bungalow, straight out of the 1960s and way past its heyday, and tasked with the responsibility of refurbishment, extension, and cladding it in a contemporary style fit for today. 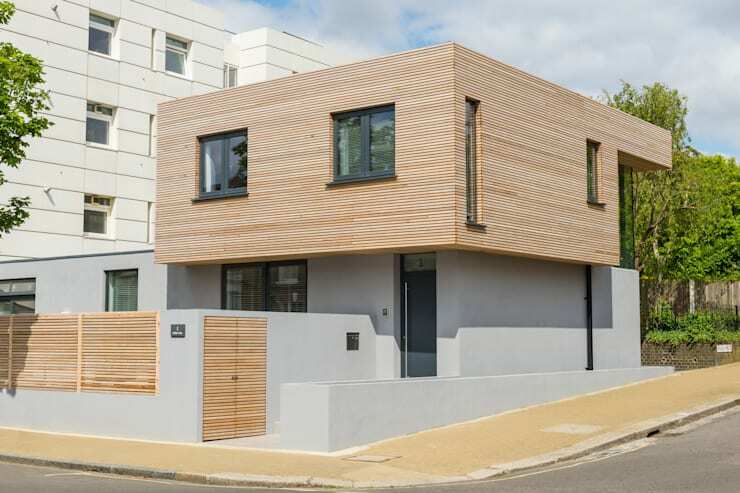 Located on a corner plot, this 4-bedroom house showcases a simple yet sharp form, with clean lines and ultra contemporary finishes. 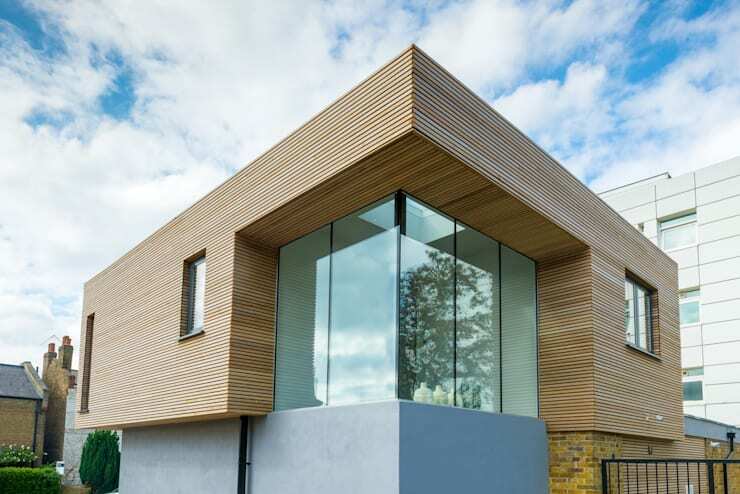 A decent amount of Western Red Cedar wood has been used for the house’s upper storey, beautifully contrasting against the industrial grey cement level just below it. 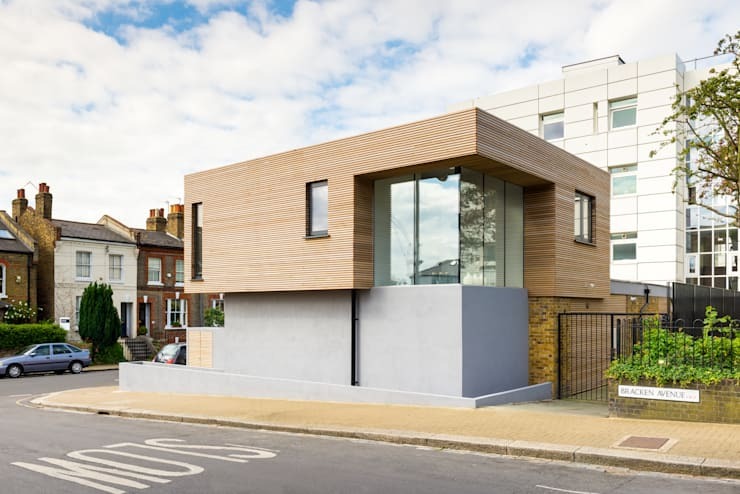 But before we get ahead of ourselves, let’s start getting some closer looks at this stylish and contemporary cube that exudes quite a strong urban presence. Viewing the refurbished model as it stands today, we can see that the house truly stands out in this neighbourhood; not just in style, but also in shape, colours, and materials. A glimpse at the lower right side reveals some of the previous structure’s brickwork – and even though we know nothing of the old layout, there is simply no comparison between what was then and what is now. The highly sustainable cedar wood that crowns the top part has been treated with an ageing finish, ensuring that the wood weathers to a lovely silver grey. Breaking up the tanned wooden division is a crystal clear corner of glass, acting as both a striking feature, and a beautiful entrance for natural lighting. The wooden storey has been cantilevered for a fantastic effect (as well as the panoramic corner view we saw earlier). Adding a striking visual to the house, one almost gets the impression that the top part of the house slightly shifted, regardless from which angle you admire it. The warmth of the cedar gets translated to part of the surrounding wall, mirrored in the fence as well as the entrance gate – stunningly contrasting with the surrounding grey. Love it or hate it, but the contemporary style simply cannot be ignored. For those who adore these creations, take a look at: Considering Contemporary Home Plans. Retreating to the interior, we find a modern décor collection to match the contemporary style that greeted us outside. 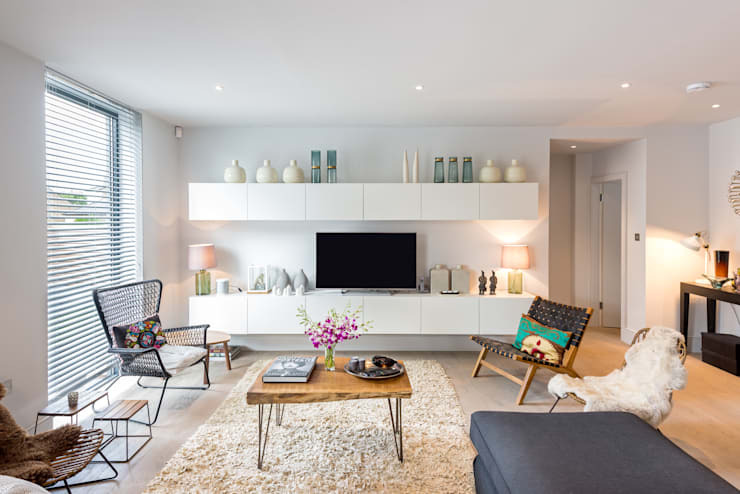 A clean and neutral palette has been used, making the bits and bobs of bright colour in the room even more effective. A soft, sandy wooden floor provides a perfect ambience, an ode to elegant Scandinavian design. Matching up perfectly are the crisp white walls, lush rug, and select pieces of furniture. Different elements of furnishings and décor add a charmingly eclectic vibe to the living room, ensuring a playful yet elegant area. And don’t forget about the horizontal blinds, which echo the linear nature of the exterior cedar, while still allowing for a pleasant portion of natural light to brighten up the room. Sharing the open plan of the living room is the kitchen, neatly tucked in the corner, but definitely not overlooked. 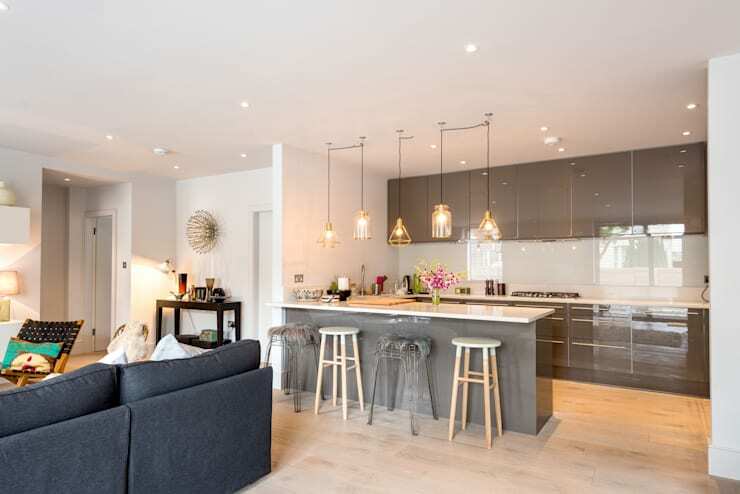 A soft mixture of brown and grey dominates the culinary corner, boasting a glossy finish that translates into a sleek space. Mismatched lighting dangles from the ceiling, while mismatched stools offer a pleasant selection of seating. A counter that is connected to the wall (effectively doubling as an island and a dining space) neatly separates the cooking part from the living area. Built-in ceiling lights twinkle from above, sparkling their approval onto this spacious and tranquil area that is sure to inspire several social gatherings. Just on the other side of that splendid corner window we encountered on the outside is the slim staircase, ready to ascend anybody to the top storey. The stairs wisely use the same sandy tone of the wooden floor in the living area, making for a soft connection between the two volumes. 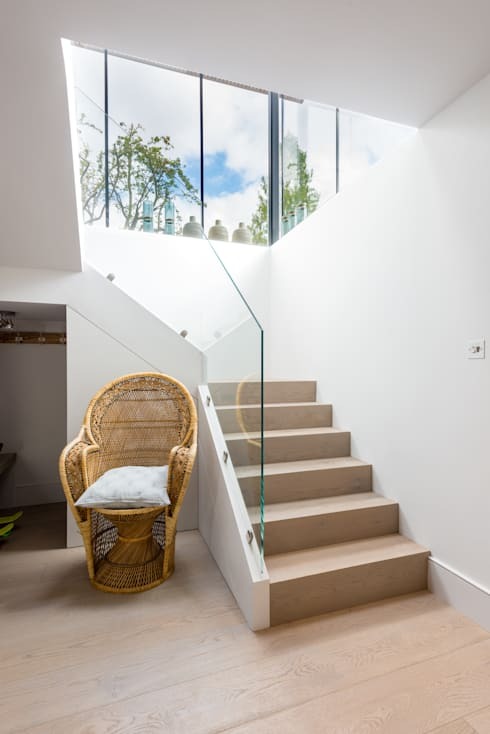 Contemporary glass balustrades stand in for staircase railings, while also allowing the natural light that pours in from the window to seep through into the rest of the house. A wicker chair, which offsets the surrounding pale colour tone, offers a comfortable reading spot. A house with such a vigorous style on the outside (and strong visuals on the inside) certainly needs a bedroom to fit in – and the designers have complied. 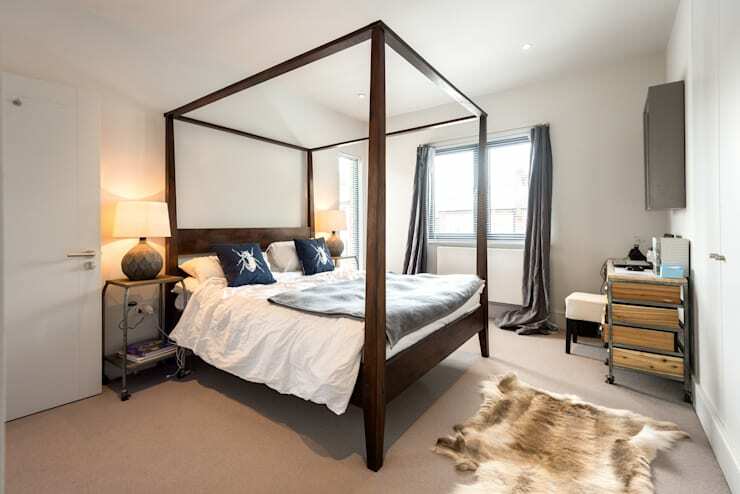 Adding to the linear dimension found outside is a four-poster bed, sturdily taking centre stage in the bedroom. The wooden floors from downstairs have been converted into a soft carpet, but still plays with the same beach tone. The neutral palette continues here, making the few elements that have a darker hue (the wooden finishing of the bed, the two scatter cushions, etc.) stand out that much more. Natural lighting from the window adds to the tenderness that is to be expected in a bedroom. Who can resist a last look at that stunning corner window, a final glimpse to wave us goodbye? Here the warmth of the cedar comes out that much stronger against the coolness of the sky, making for a delightful contrast between hard timber and transparent air. We have found a true renovation that adds a stylish vibe to this creation, which is sure to turn a multitude of heads.